On March 5, Ethereum stopped going down, and is currently trading at $126.82. 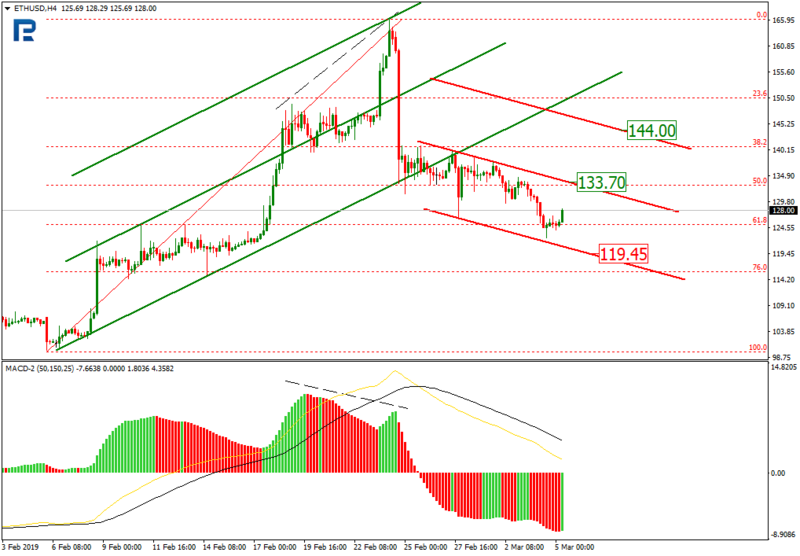 The downtrend reached 61.80% Fibo, while now the price may go up to the local resistance at $133.70. Once it happens, the crypto may both rise to $144 and bounce and hit the support at $119.45. Vitalik Buterin, the Ethereum founder, told Business Insider that his major goal was to create a crypto that would enhance Bitcoin capabilities and functions. Those are currently restricted to a single purpose (like those of a calculator), he says, and while the BTC performs it well, it is not enough. Ethereum is more like a smartphone, Buterin added, as it can support quite a few apps at a time. The Ethereum founder also commented on the cryptos he invests into. Of course, ETH is the major investment; however, around 10% of his money is invested into Bitcoin, Bitcoin Cash, ZCash, and others. Constantinople, a new Ethereum’s update, was successfully released in late February, which reduced the block mining time from around 21s to 12.50s, which is a record low. The hard fork was released without any major issues, and the hash rate was fine, too. Once Constantinople got released, the ETH devs started planning the new strategy.